is a star forming region in the beautiful, 'V'-shaped, open star cluster, The Hyades. Named for Greek mythology's sisters of The Pleiades, the Hyades asterism contains Aldebaran, the red eye of Taurus the bull. Sharpless 2-239/LBN 821 is the beautiful little orange and red 'flower' near the top-center of the surrounding brown dust, which is LDN 1551. These acronyms stand for Lynd's Bright, and Lynd's Dark Nebula, respectively. 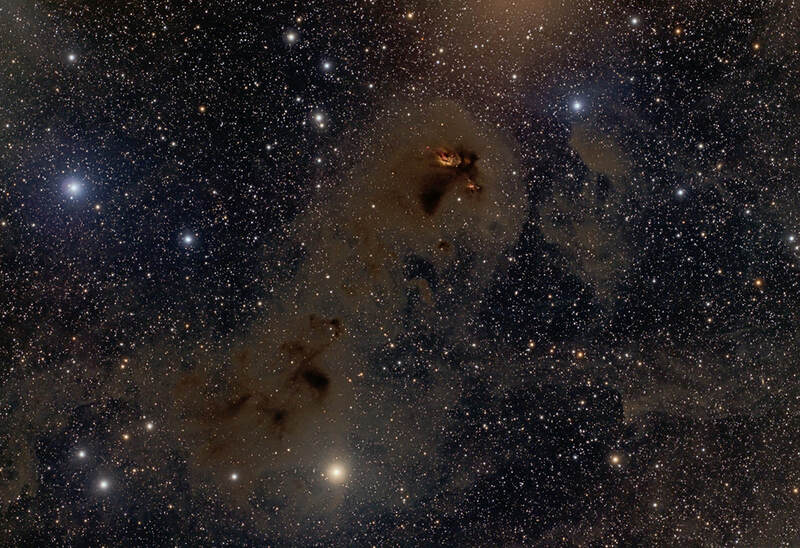 The region lies near the southern end of the Taurus molecular cloud complex, some 450 light-years distant, and is 3 light-years across. The deep red specks in the 'flower' is HH 102, a Herbig-Haro object, indicative of star forming. Many thanks to Terry Hancock of Grand Mesa Observatory for this fine data!